Community Management: Tales of a Glorified Pool Cleaner - Your community is an untapped resource for content, marketing, support and revenue. Facebook is one of the leading platforms where companies try their social media meddle in hopes of drawing followers to their brand or products. However, this is not as easy as posting articles on Facebook and the readers/purchasers will follow. Facebook is a highly competitive arena based around a person’s newsfeed. Unless you are a high profile celebrity, the vast majority of your posts will be viewed in your follower’s news feeds, not by them coming directly to you Facebook home page. In general, your competitors on Facebook are not the ones you have in the real world. They are everyone else who is in a users news feed. Pictures of their friend’s kids doing funny things. Photos of cool trips their friends have taken. The latest cat videos, Gangnum style dances and other Internet memes. And Facebook itself, limiting views of your posts via its edge rank algorithm in favor of promoted and sponsored posts. These are what you are competing with for the attention of users. And to make matters worse, many users may have followed you to state that they like your products, but don’t necessarily want to hear from you. While they anticipate news from their friends, you have to avoid being seen as a corporate entity that is crashing their party. So how do compete against friends, family and comic pets? 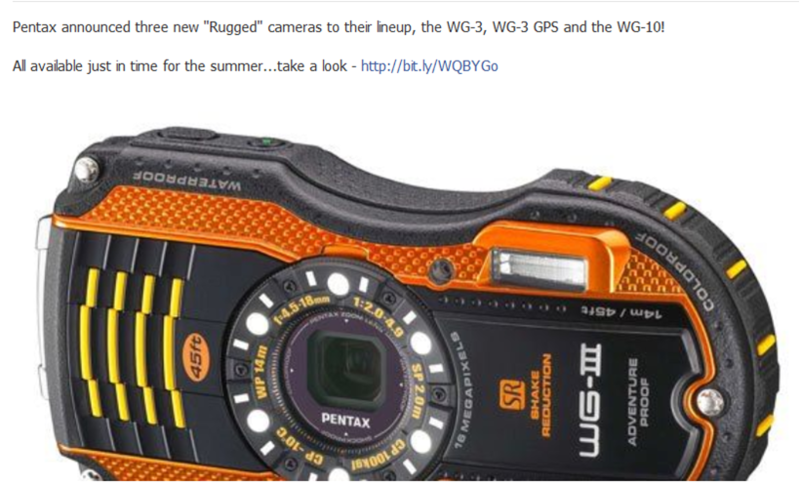 I don’t need a new camera, but I’m going to click on this since its colorful and enticing. Changing of your cover photo has a higher chance of attracting views than a simple article does, so do this about once a week. Just remember to stay within Facebook’s Guidelines. Be “Bob” Not “Mr. Corporation” – there’s a congressional analogy here. The approval rating of Congress as a whole floats in the single digits to low teens, yet the popularity of individual congress critters is in the high 40s, 50, 60s, even 70s. The takeaway – people like individuals, not entities, be they governmental or corporate. Your goal is to get your followers to see you as a person or collection of people instead of as “mega corp.” Invite them behind the scenes and into your world at work. Feature community service activities in which your company engages, company events and outings, post in real time from shows and conferences you attend with videos, and show pictures of a day in the life at your company. Use real names where possible. While the Timeline feature is no longer new, most companies have failed to embrace it. Pepper your Timeline with relevant events in your company’s history – release of major products, important dates in your industry, key initiatives, events you have or will be attending. Having an extended history lends legitimacy and suggests a certain gravitas to those who visit your pages. Recently a colleague of mine asked me “what are the most important things to do when building an online community?” I got to thinking about it and quickly had a list of about 40 things you HAVE to do being technology marketers. After spending a little time looking at the list and matching up similar concepts, I reduced the list to about 10 really important things you should do not only build, but maintain a strong community. I’ve written this list as to be platform agnostic. Whether you have or are just starting a company blog, running a forum or bulletin board, or developing your presence on Facebook, Google+, Twitter, etc., these tips will be of some use to you. So, the term “Community” that I use throughout this article refers to your user base, your potential customers, your followers and in general everyone who engages in any way with your products, brands and/or information; not so much your specific type of online community. 1) Post all the time – In the early stages of any social media operation, you’ll need content and lots of it. It’s what search engines index and what brings people to your site. When just starting out, your community will be quite small and there won’t be much organic posting. Potential users who visit and see little activity will likely leave and not come back. It’s up to you to create content that attracts eyes, generates engagement and grows your community. It doesn’t just have to be you. A small team can easily create 5-10 forum posts a day (or Facebook posts, tweets, etc.) or post at least a blog entry daily. Work with folks in your company for content support and turn to your moderators, pull in your friends or social media colleagues. Heck once you have a growing community ask them directly to write about something specific. 2) Create awesome content, or at least content that is interesting – When I say “awesome”, I’m not saying you need to write the next Harry Potter, just quality content that is relevant to your user base and invites them to engage, be it through text, video, or some other media. Keep up with the interests of your community, track what types of posts are most viewed through Google Analytics or your platform’s native tools. Know what they like to read and what drives them to engage, and then target your writing towards these topics. This isn’t to say that you should steer away from rote news, second-string information that relates to your industry, or niche topics that interest only a small portion of your community. You should continue to write about these things, but understand that the bulk of your time is best served covering areas that are of the most interest to your community. 3) Know what you want out of your community, but… There is a reason that your company has moved into the social media space. Whether it’s to cut down on service and support time, get user feedback and spend less money on testing, to get greater visibility for your brand and products, to create or repair your company’s image, to provide traffic to your main site content, to create evangelists, for user-generated content (UGC), or for direct sales and revenue generation – you need to be aware of the priorities and focus your community in that direction. But, you also have to be flexible because as your social media community grows its interests may shift a bit and develop different interests than originally planned. This is fine. Allow the community to become what it will and provide them tools to do so, but continue to root the site where your company wants it to be. 4) Set and maintain the proper tone – I’ve talked about this at some length in my own blog, but it doesn’t hurt to reiterate here. Setting the proper tone for your community is one of the most important things you will do and will have the greatest effect on how your community will grow and what kinds of people you will attract. The owners, administrators, and moderators of this site reserve the right to remove, edit, move or close any post or ban any user for any reason. By agreeing to registering, you agree to this rule and to all of the other site rules and guidelines. 6) Find your 1% – Every successful community has its 1% of ferociously active participants who seem to live on your site. While small in number, they are your biggest generators of content, your strongest supporters and your best evangelists. They love your products, your brands, etc., so much that they will spend their free time writing about them and communicating with others about them. They probably know more about your products than you do. Locate these folks and give them additional tools to help support your site. Invite them to provide guest blogs, where they can write about their expertise and enjoy the privilege of by-line. Let them know they are important to you so they continue to provide quality UGC and provide user support so that you don’t have to. 7) Be a NYC doorman, not a bouncer – Remember, your goal is to grow your community, not to create an exclusive club. Be helpful and courteous to those who venture into your site for the first time. Even if a question is incredibly simple or has been answered 10 times before, make the effort to be welcoming. If a new user asks a question that you can’t answer personally, respond to them with a welcome message and find someone in your organization who can. The simple act of providing the welcome lets your new user know they are in a good place. This is also a major part of setting the proper tone. That new user could turn out to be your most helpful poster, a creator of awesome content and your strongest evangelist. 8) Keep up with your inboxes – This is something that can easily fall through the cracks if you’re not attentive. While you will receive personal messages sent to you through your social media platform, you need to follow up with all pathways through which users send communiqués. Make sure you are on the distribution list for any “Contact Us” links. This is where users are most likely to submit problems they are having with site or its tools. This is also one of the most direct ways to engage and support your user base. You find everything from users who need help with their passwords, can’t figure out how to post on your platform, or just need personal attention. If you are not paying attention to this inbox, a lot of potential users will get fed up and never come back. Yes, answering these questions and providing support is time-consuming but something that as a technology marketer, is crucial, and think of it as an investment in your community. 9) Be as honest as you can – If you are running a corporate social media endeavor to attract IT buyers, there are things you simply cannot talk about for legal, ethical or competitive reasons. Like it or not you are in the marketing business. As a company representative in a social media endeavor, you are on the front lines of communicating with your company’s community. How you act, what you say and how you treat people reflects directly upon your company. You don’t want to violate your company’s communication policies on things like stock prices, forthcoming products, shake ups within your organization, etc. If users ask about these things simply tell them that you cannot divulge that information. Be forthright and honest. Let them know that as soon as you can talk about it, you will. 10) Let’s see…you write, you support, you protect, you market…but that’s not all – As if you don’t already wear enough hats, you have to embrace your role in ADVERTISING as well. We all dream of that community that grows completely organically, with your desired users finding you without having to lift a finger, but that simply isn’t the reality. Since most companies will not spend a lot on advertising their social media presence, that responsibility will rest on your shoulders. You will need to engage in a number of advertisement strategies to grow and maintain your community. These include, but are not limited to smart use of SEO to get your articles ranked highly, use of social media sites to leave breadcrumbs to your content and engage users who may not have found your site, keeping up with and engaging with important industry figures that have a social media presence. So what about you? What strategies do you find most useful for growing your community? In the first few entries, I focused on some rather conceptual ideas. This entry will be a bit more concrete as we discuss how to set the tone for your community. Whether you have just launched new social media endeavor or you have a long standing forum or blog, finding and maintaining the proper tone for your site is of paramount importance. The tone you set for your site is a signal to everyone who visits as to what behaviors are allowed and how to treat others. Strong forum rules keep everyone in line and everyone from yourself, your organization, your mods and your users safe. The majority of users want clear and accessible forum rules to know what exactly they can and should not do. Of course you’ll have line steppers and those who feel the rules are too restrictive, but you are not writing for them.Another key is to make sure your rules are applied as evenly as possible.As in every aspect of life, your forum will have people who are more valuable than others (your 1%, we’ll talk about them in a future entry) and those whom you personally like or dislike.Do your level best to treat them all the same way in public when rules are broken. In most instances, your moderators will spend more time functionally engaging your social media sites than you will. They are the front line of tone setting. Make sure they understand how you want them to engage the user base and all of them are acting more or less with the same focus.Having an extremely harsh or lenient individual moderator can lead to problems as their actions can be seen as precedent setting by your users.Spend some of your time reviewing the interactions of your moderators with the user base and adjust accordingly. Engage your users when they step the lines or try to cause problems. Arguments and personal animosities between users are going to crop up. Your job is to separate the parties when it moves beyond a technical discussion into personal attacks. Unless it’s obvious that one party is completely to blame, you need to pull both aside privately and just tell them to cool it.You don’t want to spend a lot of time in he said she said arguments or playing the sides.Just get them to agree to leave each other alone. Praise in public, rebuke in private unless you want a war.Your users have more time than you do to argue, dissemble your words, and search the site for instances where things were handled differently.It’s generally not worth it. If you allow doorkeepers to hammer every noob question upon arrival, you’ll lose a lot of potential members. From my own experience I usually ask a tepid question the first time I post in a forum or a blog. I want to make sure that the members are decent people and gauge the level of experience/knowledge therein before fully committing. If I’m greeted by a surly individual and no one shows up to say “Ignore Mark, he’s like that. I’m Don, How can I help…” I usually don’t stick around. It’s especially bad form if your moderators act like this as it signals your community that it’s open season on noobs and everyone else for that matter. Don doesn’t even have to be particularly helpful. He just needs to show that that type of abuse is not allowed. Being “Don” is a habit you need to get your moderators into. Again being friendly and helpful even if they are simply bridging the gap until someone truly knowledgeable can answer the question that has been asked. So what to do about “Mark”? Private Message – stop doing that.Simple and to the point.Get him to acknowledge this. You’ll know you’ve set the proper tone when your user base commits to helping you maintain it. So What’s All This About Pool Cleaning? 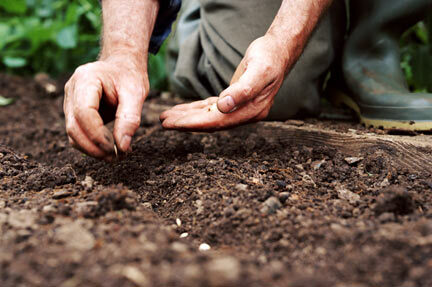 Whenever I talk to other community managers about how they view their role, most answer that that they see themselves as a gardener, a farmer, a bonsai bush trimmer, or even a parent. I refer to this as the community manager as nurturer worldview. They see themselves as taking something tiny or even helpless and through careful tending, they get it to grow it and keep it pure. While this is a popular point of view, it’s not one to which I subscribe. Forums are not living beings. Forums are places. Places of engagement, places to find information, answers, entertainment, community with like-minded individuals, to demonstrate the size of one’s brains or simply a place where users belong and feel safe. And then of course there are the assorted malcontents, trolls and spammers who absorb the bulk of your time, but I digress. That’s a discussion for the not so distant future. My favorite analogy of the forum as place is indeed the swimming pool. Think of the pool itself as the meeting place of your community on a very hot day. You have to skim the leaves and bugs from the surface so that the water seems appealing. Behind the scenes you have to apply the proper chemicals to keep the water crystal clear. Lighten up on the chlorine and algae (spam, trolls, etc.) will grow and no one will want to swim. However, you don’t want to get too aggressive with the chemicals (moderation) else you create a toxic environment. The goal is to achieve balance and it’s something you have to work on constantly. Check the pH, add water that’s been lost to evaporation, tell the kids not run while near the pool, etc. Think of how these activities would relate to running your community. Plus in this analogy I have a killer tan and get to wear shades. This isn’t to say that there is no validity in the nurturer worldview. It’s as valid as the Pool Cleaner analogy. In the end, these are only perceptions of the manager’s role within the community. But one’s perception helps to determine how you approach the management of the community. More importantly, how one perceives their forum colors the tone they try to set for their community; and the idea of “tone” is where we’ll pick up the narrative next time. So how about you? How do you see your organizations community manager? And if you are a community manager, how do you see yourself? So why a blog on community management? It seems a mundane topic. Something that should just happen naturally, right. You build a forum, start a blog, create a presence on Facebook or Twitter; and bingo you have a community! Users who like your products and services seek you out and provide traffic, quality user generated content (UGC) and buy your products. What could be simpler? Since your users already love you, there will be no problems, right? Whether you recognize it or not, you have a community by simply having a company, a brand or a website. Those who engage your products or visit your site, whether by searching out your company’s name or via search engine ARE your community. The members of your community have a wide variety of needs. Some want products, some want information, some want answers, some are looking for entertainment, and some just want to vent. The key is how to harness your community so that they provide value to your company at the same time you provide access to what they need. And that’s where community management comes in. Next Tuesday we’ll focus on more traditional aspects of community management and why this blog is about pool cleaning. Part evangelist, part content manager, part strategist and part pool cleaner; the Community Manager is a critical part of any social media initiative.